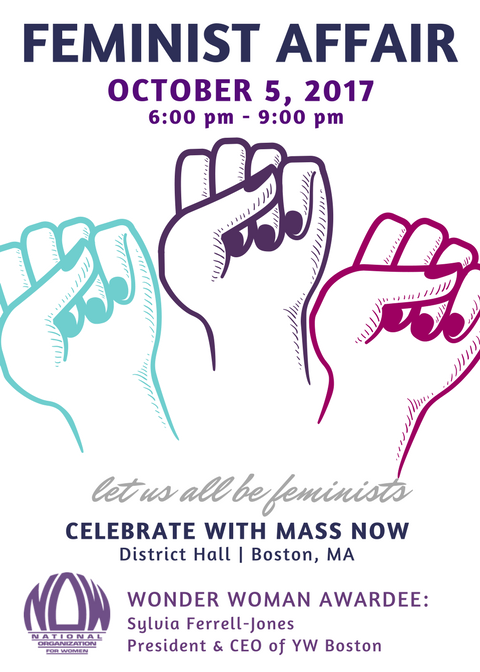 Feminist Affair 2017 » Mass NOW INC.
Join us and the Boston-area feminist community on Thursday, October 5, as we celebrate our accomplishments over the past year at the 2017 Feminist Affair! We’ll look to the future by celebrating our 2015 & 2016 Feminist in Action Grant Awardees (and announce our 2017 grant winner). And we’ll celebrate the work of one fabulous local feminist when we present our Wonder Woman Award to Sylvia Ferrell-Jones ,of YW Boston. It will be a a night of fun, featuring good music, food, drinks, and feminist company. Stay tuned for an exciting announcement about our keynote speaker. Tickets start at $125. This is a fundraising event for the Mass NOW Foundation – ticket purchases are tax deductible to the fullest extent of the law.